The United States has opened a "diplomatic full court press" to urge Turkey not to invade northern Iraq, the State Department said Monday, as tensions between the two countries soared following an ambush by rebel Kurds that killed 12 Turkish soldiers and left eight missing. The increased dialogue led to one announcement by Iraq's president, a Kurd, who said Monday that Kurdish rebels will announce a cease-fire, as Turkey threatened to attack Kurdish guerrilla bases in northern Iraq. Turkey is moving fire power and troops closer to Iraq as a border war threatens to become an invasion the United States desperately does not want to happen, reports CBS News national security correspondent David Martin. Secretary of State Condoleezza Rice called Turkish Prime Minister Recep Tayyip Erdogan and the leader of Iraq's Kurdish region, Massoud Barzani, on Sunday to press the U.S. case for restraint from Turkey and Iraqi action against the outlawed Kurdistan Workers' Party (PKK), department spokesman Sean McCormack said. "We do not believe unilateral cross-border operations are the best way to address this issue," he said, describing Rice's call to Erdogan, whose government has threatened military incursions into Iraq to deal with the PKK. "It's important that there be action to counter the PKK." "In our view, there are better ways to deal with this issue," he said, stressing that United States regards the PKK as a terrorist organization. "We think the best way to do this - and that is to address the PKK threat - is for the Turks and the Iraqis to work together to mitigate it and eliminate it," McCormack added. "We are going to do everything we can to encourage Turkey and Iraq to work together to address what is a common threat," he told reporters, adding that Washington wants authorities in Iraq to step up their efforts against the PKK. "She (Rice) underlined to President Barzani the importance of Iraq working actively with the Turkish government to counter what is a real threat to Turkish citizens," he said. "It's important that there be action to counter the PKK." Erdogan said earlier that he had told Rice that Turkey expected "speedy steps from the U.S." in cracking down on Kurdish rebels and that Rice had asked "for a few days" from him. McCormack did not dispute the account of the conversation but declined to comment on what Rice had meant by asking for "a few days." As Rice was speaking to Erdogan and Barzani, McCormack said, the U.S. Ambassador to Iraq, Ryan Crocker, was making similar points in Baghdad with Iraqi President Jalal Talabani - himself a Kurd - who ordered the PKK to lay down their arms or leave Iraq, and Iraqi Prime Minister Nouri al-Maliki. The spokesman added that he "would not be surprised" if White House officials, including possibly President Bush, followed up the Rice and Crocker conversations with Turkish and Iraqi officials. "From our perspective this is a diplomatic full-court press," McCormack said. "We want to see an outcome where you have the Turks and the Iraqis working together and we will do what we can to resolve the issue without a Turkish cross-border incursion." President Talabani said, and his office confirmed, that the PPK will issue a cease-fire later Monday. More details were not immediately available. Turkish Foreign Minister Ali Babacan said his country will pursue diplomacy before it sends troops across the rugged frontier. "We will continue these diplomatic efforts with all good intentions to solve this problem caused by a terrorist organization," Babacan told reporters in Kuwait where he was visiting as part of a tour of Arab states to explain Ankara's plans. "But in the end, if we do not reach any results, there are other means we might have to use." U.S. intelligence believes Turkey will stop short of a full-scale invasion, adds Martin. So for now, says one military officer, the plan is to "stay the hell away from there and hope to God it doesn't get out of control." Turkey's military on Monday confirmed that eight soldiers were missing after Sunday's clash with Kurdish rebels in which 12 other soldiers were killed. "Despite all search efforts, no contact has been established with eight missing personnel since shortly after the armed attack on the military unit," the military said in a statement posted on its Web site. Earlier, the pro-Kurdish Firat news agency, based in Belgium, released the names of seven people it said were Turkish soldiers abducted by separatist fighters in Sunday's ambush. It said an eighth soldier was also taken captive but did not release his name. On Monday, dozens of military vehicles headed toward the Iraqi border. 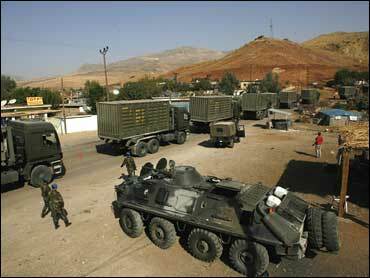 AP Television News footage showed a convoy of 50 military vehicles, loaded with soldiers and weapons, heading from the south-eastern town of Sirnak towards Uludere, closer to the border with Iraq. It was unclear whether the vehicles were being sent to reinforce troops engaged in fighting with rebels on Turkish soil or were preparing for possible cross-border action. Tens of thousands of Turkish troops are already deployed in the border area. Ambulances decorated with Turkish flags drove around main streets, their sirens on. Some 13,000 schoolchildren in Bilecik in eastern Turkey held a minute of silence while people marched down a main street, waving the Turkish flag, the state-run Anatolia news agency reported. In Bursa, in northwest Turkey, some protesters walked to a military conscription office and asked to enlist to fight rebels. Nevzat Uysal, a resident of the town of Sirnak, told AP Television he thought it was "better we go into northern Iraq, not to invade but to ruin the PKK, and accomplish our aims." "We want parliament to take concrete steps on terror. We want peace and welfare to be established in the region," a resident of Yuksekova told AP Television. Meanwhile, in Istanbul, about 2,000 protesters, mostly members of an opposition party, denounced the attack and urged the government of Prime Minister Erdogan to resign, the private Dogan news agency reported. The rebel attack occurred four days after Parliament authorized the government to deploy troops across the border in Iraq, amid growing anger in Turkey at perceived U.S. and Iraqi failure to live up to pledges to crack down on the rebels of the Kurdistan Workers' Party, or PKK, based in northern Iraq. Turkey says rebels periodically cross the border to stage attacks in their war for autonomy for Turkey's predominantly Kurdish southeast. More than 30,000 people have died in the conflict that began in 1984. Across the border in Iraq, in the oil-rich city of Kirkuk, about 2,000 protesters turned out for a demonstration on Monday against a potential Turkish incursion into the autonomous region of Kurdistan in northern Iraq. Protesters marched to the centre of Kirkuk, waving Kurdish flags and banners calling for peace and dialogue with Turkey. But Najat Hassan Ali, member of the central committee of Kurdish Party Organizations, said that while Iraqis preferred a peaceful resolution they were "ready to defend the borders of Kurdistan." "We are ready to defend the sanctity of our homeland and the dignity of its people," Ali told AP Television.